In the course of exploring and analyzing the impressive library of CD images curated at the Internet Archive’s Shareware CD collection, one encounters a wealth of methods for copying a complete CD image onto other media for transport. In researching the formats, I have found that many of them are native to various binary, proprietary CD programs that operate under Windows. Since I have an interest in interpreting these image formats and I would also like to do so outside of Windows, I thought to conduct a survey to determine if enough information exists to write processing tools of my own. Remember from my Grand Unified Theory of Compact Disc that CDs, from a high enough level of software abstraction, are just strings of 2352-byte sectors broken up into tracks. The difference among various types of CDs comes down to the specific meaning of these 2352 bytes. Most imaging formats rip these strings of sectors into a giant file and then record some metadata information about the tracks and sectors. This is perhaps the most common method for storing CD images. It’s generally only applicable to data CD-ROMs. File images generally end with a .iso extension. This refers to ISO-9660 which is the standard CD filesystem. Sometimes, disc images ripped from other types of discs (like Xbox/360 or GameCube discs) bear the extension .iso, which is a bit of a misnomer since they aren’t formatted using the ISO-9660 filesystem. But the extension sort of stuck. I see the BIN & CUE file format combination quite frequently. Reportedly, a program named CDRWIN deployed this format first. This format can handle a mixed mode CD (e.g., starts with a data track and is followed by a series of audio tracks), whereas ISO can only handle the data track. The BIN file contains the raw data while the CUE file is a text file that defines how the BIN file is formatted (how many bytes in a sector, how many sectors to each individual track). This originates from a program called DiscJuggler. This is extremely prevalent in the Sega Dreamcast hobbyist community for some reason. I studied the raw hex dumps of some sample CDI files but there was no obvious data (mostly 0s). There is an open source utility called cdi2iso which is able to extract an ISO image from a CDI file. The program’s source clued me in that the metadata is actually sitting at the end of the image file. This makes sense when you consider how a ripping program needs to operate– copy tracks, sector by sector, and then do something with the metadata after the fact. Options include: 1) Write metadata at the end of the file (as seen here); 2) write metadata into a separate file (seen in other formats on this list); 3) write the data at the beginning of the file which would require a full rewrite of the entire (usually large) image file (I haven’t seen this yet). Anyway, I believe I have enough information to write a program that can interpret a CDI file. The reason this format is favored for Dreamcast disc images is likely due to the extreme weirdness of Dreamcast discs (it’s complicated, but eventually fits into my Grand Unified Theory of CDs, if you look at it from a high level). MDF and MDS pairs come from a program called Alcohol 120%. The MDF file has the data while the MDS file contains the metadata. The metadata is in an opaque binary format, though. Thankfully, the Wikipedia page links to a description of the format. That’s another image format down. The CloneCD Control File is one I just ran across today thanks to a new image posted at the IA Shareware Archive (see Super Duke Volume 2). I haven’t found any definitive documentation on this, but it also doesn’t seen too complicated. The .ccd file is a text file that is pretty self-explanatory. The sample linked above, however, only has a .ccd file and a .sub file. I’m led to believe that the .sub file contains subchannel information while a .img file is supposed to contain the binary data. So this rip might be incomplete (nope, the .img file is on the page, in the sidebar; thanks to Phil in the comments for pointing this out). The .sub file is a bit short compared to the Archive’s description of the disc’s contents (only about 4.6 MB of data) and when I briefly scrolled through, it didn’t look like it contains any real computer data. So it probably is just the disc’s subchannel data (something I glossed over in my Grand Unified Theory). I have dealt with the CISO (compressed ISO) format before. It’s basically the same as a .iso file described above except that each individual 2048-byte data sector is compressed using zlib. The format boasts up to 9 compression levels, which shouldn’t be a big surprise since that correlates to zlib’s own compression tiers. Wikipedia has a category for optical disc image formats. Of course, there are numerous others. However, I haven’t encountered them in the wild for the purpose of broad image distribution. Throughout my own life, I have often observed that my own sense of nostalgia has a window that stretches about 10-15 years past from the current moment. Earlier this year, I discovered the show “Alias” and watched through the entire series thanks to Amazon Prime Instant Video (to be fair, I sort of skimmed the fifth and final season which I found to be horribly dull, or maybe franchise fatigue had set in). The show originally aired from 2001-2006 so I found that it fit well within the aforementioned nostalgia window. But what was it, exactly, about the show that triggered nostalgia? The computers, of course! 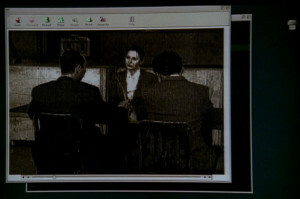 The show revolved around spies and espionage and cutting-edge technology necessarily played a role. The production designer for the series must have decided that Unix/Linux == awesome hacking and so many screenshots featured Linux. Since this is still nominally a multimedia blog, I’ll start of the screenshot recon with an old multimedia player. Here is a vintage Mac OS desktop running an ancient web browser (probably Netscape) that’s playing a full-window video (probably QuickTime embedded directly into the browser). Studying that screenshot, we see that the user logs in as root, even to the desktop environment. Poor security practice; I would expect better from a bunch of spooks.